The route is an unflat, off and on road route taking in the fields between Bilton and Killinghall with a run along the Nidd and under the A61, to return over the fields to the Knox Pub for Pie Night!! Please let Nadene Wilkinson know you are coming. 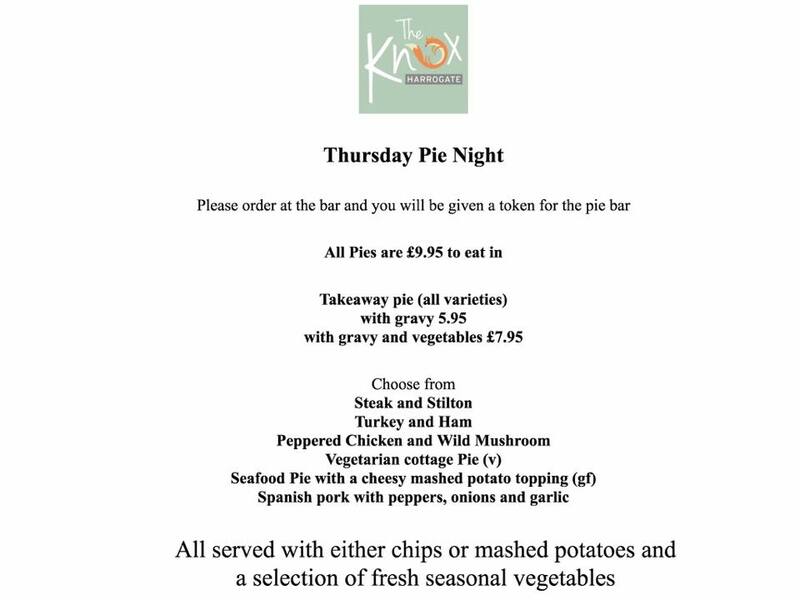 It is pie night so no pre ordering is needed, just turn up and choose your pie on the night. From The Knox, turn right and head down Knox Lane crossing Oak Beck by the Packhorse Bridge, touchng the plaque with your club name on it. Follow the Public Footpath sign up the hill and squeeze between two houses, over the wall and continue across the field. Bear left to head towards Killinghall and Nidd House Farm and enter Crofters Green. 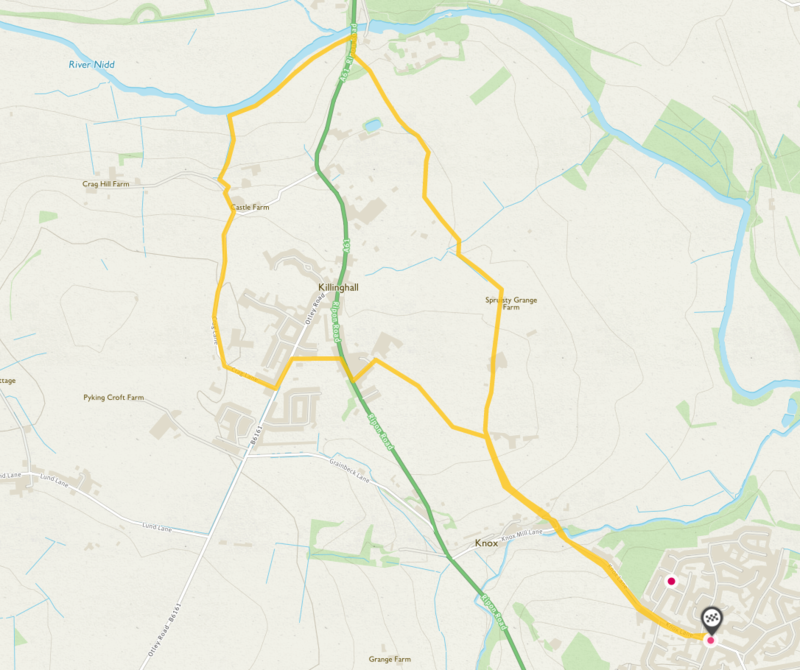 Cross the A61 at the island and take the footpath by the Church to Otley Road. Turn left and then right by the school onto Crag Lane. Follow Crag Lane round to the right with a joyous downhill section to Castle Farm and a right turn into the field. Stay left, close to the hedge/fence line. Continue to bottom of the field and then bear right with the River Nidd on your left, under the A61 and turn right. Then left through a gap and up a path to a lovely style/steps/wall crossing. At this point, should you wish to extend the run, turn left here and proceed along the Greenway. When you reach the Viaduct turn right through Bilton Woods, down the steps, turn right again past the allotments, through Knox Country Park, up Old Barber and return to The Knox. Keep right along hedge line and follow yellow footpath signs. Arrive at Spruisty Grange, through farmyard, feels weird but its ok.
Continue to Spruisty Hall Farm, Spruisty Hill, and back to Spruisty Hill Farm where you retrace your steps over the Packhorse Bridge to The Knox. Save something for this final ascent!! !